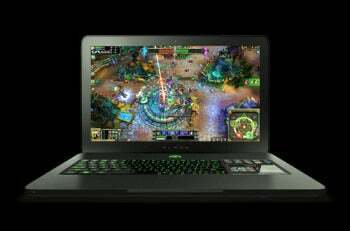 Gaming hardware manufacturer Razer today launched what might be the most attractive gaming laptop to date. The 17.3-inch Razer Blade is just 0.88 inches thin and breaks the 7-pound weight barrier, but still boasts the high-end hardware specs gamers require. With a unique LCD multitouch trackpad on the side, the Blade may even surpass expectations. You’ll need a $3,000 laptop budget to pick one up later this year, however. In a trade-off between portability and performance, gaming laptops have typically been clunky beasts. There have been eye-catching, yet powerful gaming laptops before, like the Asus Lamborghini VX7 and the Alienware laptop series. The Blade, however, delivers on sleekness and light weight without skimping on the specs. Inside the full aluminum chassis is an Intel Core i7 processor (2.8GHz Core i7 2640M, to be exact) and NVIDIA GeForce GT 555M graphics card with 2GB of video memory. To really see every nuance of every virtual world, you’ve got a full HD display (a resolution of 1920 pixels by 1080 pixels), and the stock 8GB of RAM should keep your laptop running smoothly. However, the LCD touchpad on the right side of the laptop (where other laptops have a number pad) is the most innovative feature of the Blade. You can use it as a multi-touch panel/trackpad or switch it to display in-game information while using an external mouse. In a separate panel above the input LCD are 10 customizable, glowing buttons to give you an edge in battle. This is definitely a lot of gaming machine in not too much space. Razer calls it “the first true gaming laptop,” which might be a little much, but the Blade definitely is setting a new standard for gaming on the go. You can expect the Blade to debut in the fourth quarter of this year for $2799.99—expensive, but that’s expected from game-changing gaming laptops.